Full length recombinant human N-terminal His tagged HP1b (Heterochromatin Protein 1 Homolog Beta) protein, produced in E. coli. HP1 beta (UniProt/Swiss-Prot entry P83916) is a component of heterochromatin. It recognizes and binds to histone H3 tails methylated at 'Lys-9', leading to epigenetic repression of transcription. HP1b does not associate with chromosomes during mitosis. It may also interact with lamin B receptor (LBR), thereby contributing to the association of the heterochromatin with the inner nuclear membrane. 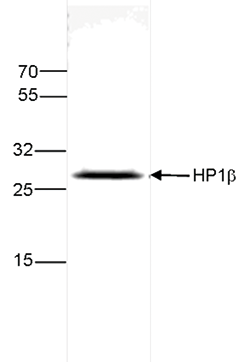 SDS page of the HP1ß recombinant protein. The position of the protein of interest is indicated on the right; the marker (in kDa) is shown on the left. Diagenode strongly recommends using this:	Recombinant human Hp1 beta (CBX1) (Diagenode Cat# C23010102). Click here to copy to clipboard.